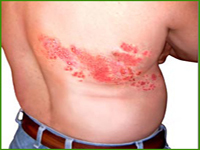 Herpes zoster, commonly known as shingles, is caused by the same virus responsible for chicken pox. After the initial exposure, herpes zoster lies dormant in certain nerve fibers. It may become active as a result of many factors such as: aging, stress, suppression of the immune system, and certain medications. Herpes zoster can cause several problems with the eye and surrounding skin that may have long term effects. Inflammation and scarring of the cornea, along with conjunctivitis (inflammation of the conjunctiva ) and iritis (inflammation of the iris) are typical problems that require treatment. In some cases, the retina and optic nerve are involved. Eye problems caused by severe or chronic outbreaks of herpes zoster may include: glaucoma, cataracts, double vision, and scarring of the cornea and eyelids. Many who experience this infection find it extremely painful. This acutely painful phase usually lasts several weeks; however, some continue to experience pain or neuralgia long after the outbreak has cleared.There are different conditions that are caused by these herpes viruses. Some of the most common health conditions that are associated with herpes include chicken pox, shingles, cold sores around the mouth and genital herpes. The severity of each of these conditions could vary from one person to the other. The symptoms seen in each of the herpes condition are also varied in nature. Use an ice pack to help alleviate pain and swelling, and take a hot bath (with a pinch of baking soda) to help reduce itching. Keep the affected area dry and clean. Apply tea tree oil directly onto the sores several times a day. Avoid touching, rubbing or scratching the sores and wash your hands immediately after contact with them to prevent the infection spreading to other areas or other people. Boost the immune system with daily exercise, sufficient sleep and a healthy balanced diet. Reduce stress levels and take care of your emotional well-being. Consider counseling or stress management if you struggle to do this alone. Increase vitamin C intake during outbreaks. Consider taking supplements of the amino acid L-lysine, zinc, and garlic. Avoid spicy and acidic foods as well as foods high in salt when you have an outbreak. The effective remedy for herpes is rub ice on the herpes for a few minutes. It would provide instant healing effect. Add 25 grams each of dried mullein, mallow roots and marsh mallow roots in 3 liters of water,Simmer it for about 3 minutes. Filter the mixture and use on a compress day and might. This would reduce irritation and also prevent herpes. Take a tea bag and dip it in a cup of hot water. Apply this warm tea bag on the herpes for half an hour.